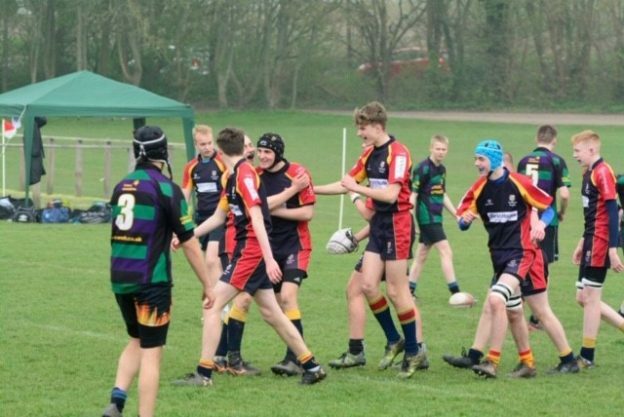 With the onset of April it was time for the annual jamboree that is the Surrey Waterfall Cup Finals Day, played this year at Dorking. The B squad had a Treasurer’s Shield Final against London Irish, with the As having to contend with a Bronze play-off in the President’s Plate. The Bs opened the day in confident mood, having beaten Irish already this season. The intensity was high and they looked dangerous with the ball and able to snuff out Irish advances without it. The first attack into the Irish 25 came from Harrison, with Keaton on his shoulder, which ended with a Chob’ penalty 5 out. The initial tap and drive was held but the ball came to Andy out wide who cut an acute angle over the line, adding the conversion himself for a 7-0 advantage. Tom bravely gathered a high restart under pressure from two Irish players and laid it back perfectly for Saxon to carry into the green half. Forwards and backs worked together as Ben burst through in midfield ably supported by Teo and Sam and play was right back on the Irish line. The ball came back cleanly and Samuel was over in the corner to increase the lead to 12 points. Irish now had their first trip to the red zone only to lose the ball in a tackle and Daniel made the clearing kick. After a couple of exchanges in midfield Chob’ won a turnover and Andy appeared from nowhere moving at a pace that nobody remembers Pete having. None in the defence could lay a hand on him and Chob’ were 3 tries to the good at 17-0. The opposition had seen enough now and for the remainder of the first half they were in the ascendancy. They managed to set a pattern of play to carry around the fringes and draw in the blue defenders. This pattern led directly to their first try with a rumble over and then right on the whistle a quickly taken penalty inside the Chob’ 25 gave them their second score. After playing so well for the opening 20 minutes Chob’ only had a 7 point lead at the break. The second half began as a much tighter affair, neither side being able to land any serious blows. After 15 minutes though Chob’ were undone by another quickly taken tap penalty with someone in a green shirt wriggling over to cut the lead to just a couple of points. Chobham now had to regroup or face the prospect of letting a comfortable lead slip completely. To their credit this is exactly what happened. The forwards moved into the 25 before Danny ghosted through and only a high tackle stopped him going over. Opting for the scrum it was Olly popping up at number 8 who had the strength to wrestle over the line to extend the lead to 7 points once more as Samuel hit the crossbar from wide out. Irish now had to hit back and managed to do so very quickly. Putting pressure on the restart they were halted on the 25 yard line initially but they persevered and found a gap right in the corner to close to 2 points once more. With 10 minutes to go it was anyone’s guess who would come out on top. Chob’ were pretty sure it was going to be them as a strong effort from the pack again took them into Irish territory. Irish tried to counter but Lewis held on to a loose ball and carried back into the Irish 25, winning a penalty at the breakdown. Ewen took the quick tap and Callum was on his shoulder to barrel over. Samuel was on target and the boys had a two score lead again. In the closing minutes Irish huffed and puffed but the blue defence was solid, ultimately seeing the ball off on the final whistle to take the Shield with a well-earned 29-20 victory. The As fixture against Vandals was no match for the tension of the earlier game as Chob leapt out to an early 10-0 lead as pace and precision gave Jack two early scores. A third try came soon after with the Vandals losing possession from a scrum on their line. Jack had the assist this time as the back-line made simple passing create an overlap on the left for Adam to stroll round under the posts. Pressure on the full-back led to a fourth try as a deep kick had the Vandals 15 scrambling. An attempted clearing kick as he was scragged didn’t go far. 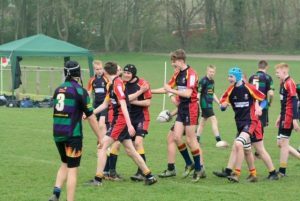 Max was right there following up to calmly gather the ball and cross over for his first try for the A squad, the cue for great celebration amongst his team-mates. It wasn’t all one way traffic as Vandals stemmed the flow of points and got on the board themselves just before the interval. Good support play committed enough of the Chob’ defence for one of the centres to score near the posts making it 24-7 on the whistle. Chob’ didn’t waste much time in scoring at the start of the second period. A safe catch from Matt and a forwards drive drew the defence in a little narrow. Sharp passing out the Rhys on the far wing and what looked like a narrow overlap doing the business. Vandals centre then got his second from a rare attack. The fly-half made a break and offloaded as he was brought down to cut the lead to 29-14. Any thoughts of a comeback were short-lived as Chobham forced a spill from the restart. Fin at 12 cut a great line to close on the line. It was the forwards this time who crossed the whitewash with Olly driving over, pushing the lead to 20 points. As with the first half Vandals managed to stop the bleeding and Chob’ rang the changes to give the full squad plenty of game time. It was from one of these changes that the next points eventually came with Ewen on at 10, George made a break at inside centre being hauled down a couple of yards short. A couple of quick phases later Connor was over to make absolutely sure of the win. The game seemed to be winding to a conclusion but a trademark Gideon interception around halfway kicked the scoreboard into action again, and there was still time for Rhys to cross for his second, on the left this time dancing round his opposite number and scooting round under the posts. With the conversion successful the ref blew for time and Chobham had run out 53-14 victors. B Squad: Daniel, Samuel, Lewis, Keaton, Andy, Ewen, Sam, Billy, Harrison, Ben, Max, Harvey, Tom, Teo, Saxon, Jack, GeorgeC, Danny, Rhys, Callum, Olly. A Squad: Jack, Adam, Aran, Fin, Rhys, GeorgeO, Gideon, Billy, Charlie, Olly, Callum, Matt, Al, Harrison, Doug, Connor, Max, Ewen, Andy.